Last but not least, Rosemarie over at Turin Mamma will be preparing melanzane ripiene, or stuffed eggplant. But the recipe! Here the overall tomato-ness of our tomatoes is intensified and concentrated with a little roasting, the perfect vehicle for the filling, or rather: a delightful mix of sharp-salty Parmesan, spicy assertive garlic, and summery basil, all held together with a little bread and a good bit of tomato for an extra tomato punch. But wait, there's more! 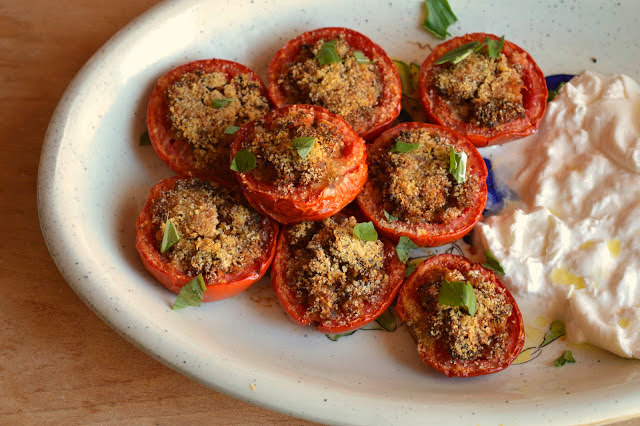 -- each tomato half is topped off with a scattering of breadcrumbs and a drizzle of olive oil for little crunch, texture, and toasty golden brown color (swoon). 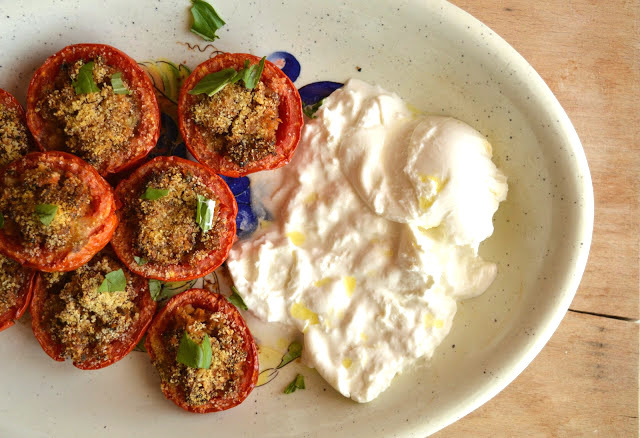 It will probably not surprise you in the least then to know that these made for a divine lunch paired with some oh-so-heavenly burrata and an extra sprinkling of basil, but don't let me tell you what to do! These would also be great eaten alongside mozzarella di bufala or even ricotta or goat cheese, or just enjoyed as a starter on their own, if you want to keep things simple. Downside: I know, I know, you need to turn on your oven to make these but Upside: you probably have air conditioning in your house, unlike us living in Roman apartments, so this shouldn't be a problem for most of you. That being said -- whatever the temperature in your kitchen might be, these are worth making, promise. A couple of notes: If you don't have stale bread on hand, no problem! Mine was fairly fresh and I just toasted it for a bit and it worked fine. Note that if the filling is a little dark it's because I used a darker whole wheat bread. Feel free to experiment with the cheese and herbs here (Pecorino instead of Parmesan, oregano and thyme instead of basil, etc). If you don't have a food processor, you could always chop the ingredients by hand very finely; the filling won't be as smooth but it will still work just fine. I don't love garlic so I used just half a clove, but feel free to use a full clove if you like. I ended up using 1/4 teaspoon of salt in my filling but start slowly and taste as you go, as the saltiness of your cheese/the salt content in you bread etc might be different than what I used (remember: when it comes to salt, you can always add but it is more difficult to subtract). Finally, this filling would also be good in summer zucchine or as a filling for other veg. 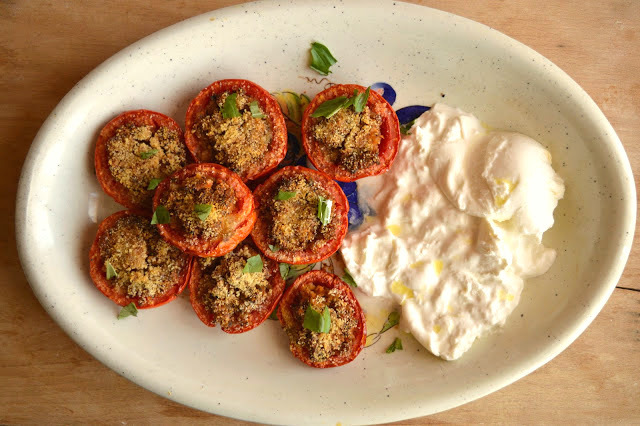 Looking for other Tomato-centric recipes? 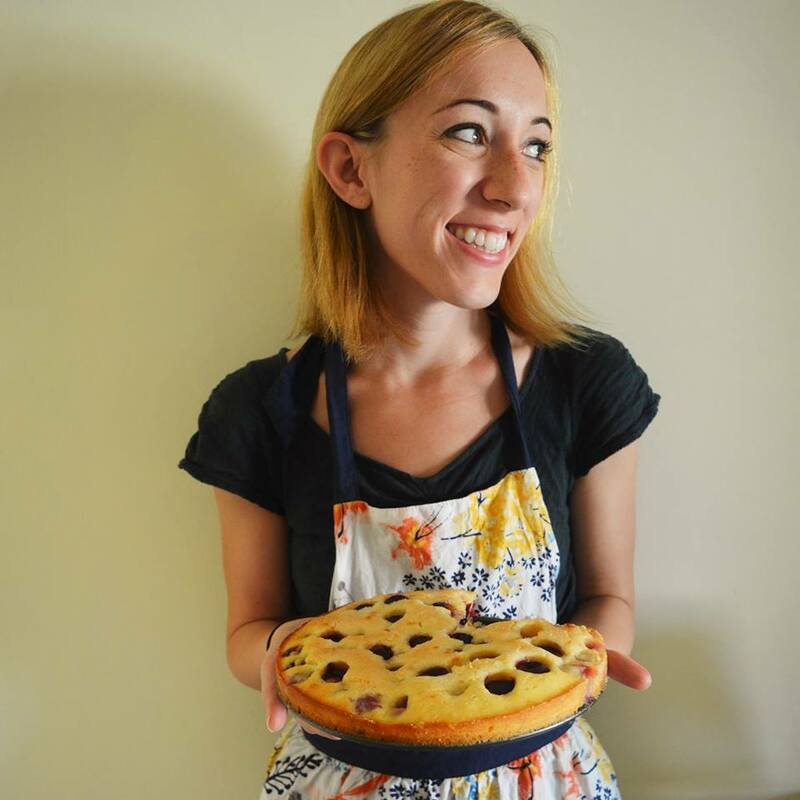 I've got these Rice-Stuffed Tomatoes with Potatoes, this Spaghetti with Cherry Tomatoes and Basil, this Cherry Tomato Cobbler, these Tomato Basil and Goat Cheese Shortcakes, this Tomato Corn and Zucchini Pie, and this Cherry Tomato Crostata. Cut the tomatoes in half (lengthwise or crosswise is fine, as you prefer) and using a spoon and the help of a knife if necessary, remove the pulp from the tomatoes. Put the pulp and juices in a small bowl and set aside. Let the tomatoes drain on to a few paper towels for about 15 minutes. In the meantime, put the garlic, basil, bread, salt, and 2 tablespoons of the Parmesan in a food processor and process until fine. Add the tomato pulp -- not the juices, just the pulp! -- to the food processor and process again. 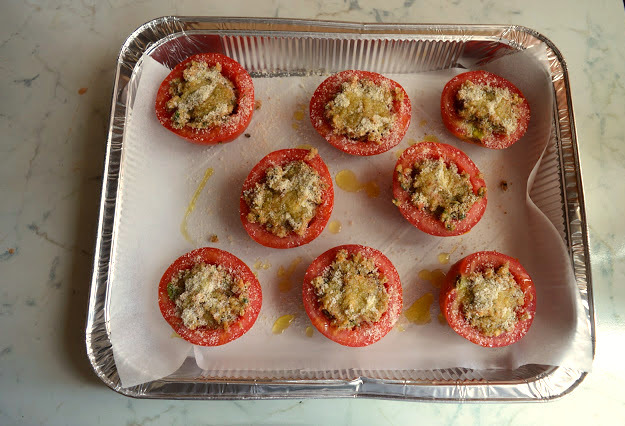 Line up the drained tomato halves in a baking sheet lined with parchment paper. Fill each tomato half with the stuffing mixture. Next, mix together the 1 tablespoon of breadcrumbs and remaining 1 tablespoon of Parmesan and sprinkle them over the tomatoes. Drizzle the tomatoes with some olive oil, and bake in a 350 degree oven for 45 minutes to an hour, or until the filling is golden brown and the tomatoes are softened. Let cool and serve, accompanied by some mozzarella di bufala or burrata if you'd like. Serves 3-4. 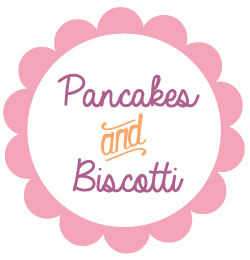 Beautiful recipe, Francesca! I love how you paired these with burrata. I'm coming over!